*Update 12/4 – As new deals/opportunities come up I will be updating this post. Bookmark it and please know that some of these deals will be time sensitive! If I know the end date, I’ll let you know, but some of the deals are while supplies last or can be turned off at the vendor’s discretion! One of the reasons I love smoking meat is because you don’t really need a lot of things to get the job done. Give me a smoker, a large chunk of meat, some herbs and spices, and a good thermometer, and I’ll give you something delicious. At least that’s what I thought. That all changed last week when we visited my parents for Thanksgiving in Colorado. Dad has an awesome smoker, and over the course of the week, we cooked a brisket, chicken wings, pumpkin pie, an elk meat cheeseburger fatty, and a 22-pound turkey. We got it all done, and everything turned out great, but I found myself missing a few things that we have in our kitchen that my parents didn’t have. None of the following items are mandatory to make a great meal, but they certainly make it easier for me, and if you’re holiday shopping… this might be a good list for you to have. These are the things I use almost every time I cook on my smoker, and anyone that loves to make barbecue would love as a gift. Let’s be real, if you’re reading this, you probably already have a smoker. If you don’t have a smoker, WHY. There are a lot of great options out there. I’m partial to my Traeger. My Pro34 is easy to use, it has plenty of cooking space, and I have never had a major issue with it. I love that I can set the temp and walk away, and I don’t have to mess with charcoal or manage a fire. I know some people love that part of smoking meat, but I just don’t have the time or patience for that. If you’ve visited my site before, you know this is one of the things I just can’t live without. Most of the electric pellet smokers on the market today include a built-in temperature probe. That probe is great for giving you a ballpark temp during a cook, but what I’ve found is that those probes can be as much as 10 degrees in temperature high or low. 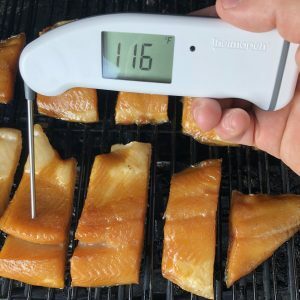 One of the reasons I really love my Thermapen is because it takes all the guesswork out of knowing when my foods have been cooked to a safe temp… PS… This fish is not done cooking! Use the built-in probe to get you close, but use a Thermapen or Thermopop to get you home. I’ve talked about both of these thermometers before. If you’re not cooking to temp when you’re smoking meat, you’re doing it wrong. Thermoworks has a ton of other great products available too. Check them out. 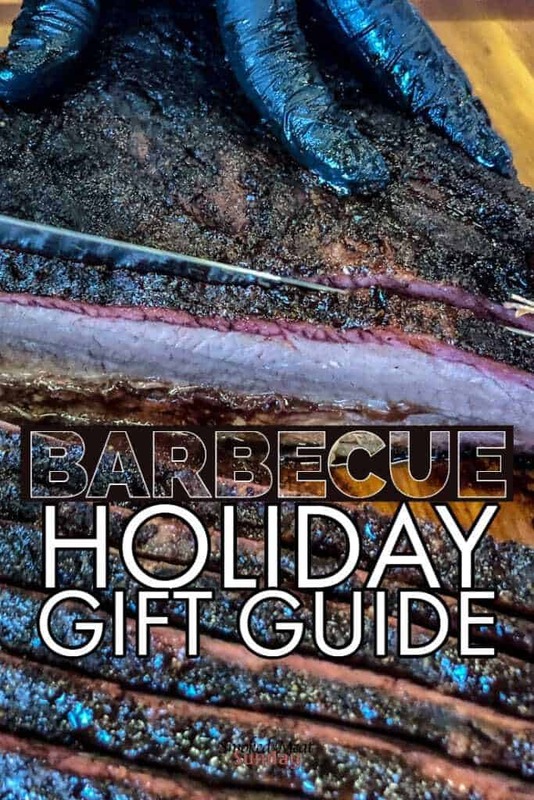 When you’re done reading this bbq holiday gift guide be sure to hop over to my guide on temperatures for different cuts of meat. Mom and Dad don’t have a big cutting board, and really I don’t blame them. They’re cooking for two these days, and it’s rare for them to cook a piece of meat that can feed 20 people. I used the pan to prep the brisket and then smoked the brisket on top of all of the trimmed fat in the pan. When the brisket was done cooking I placed a few plastic rollup cutting boards inside the pan and then placed the brisket on those so I could slice and not make a mess. It all worked out. The pan isn’t ruined, and the brisket was delicious. Next time I’ll buy a disposable pan for the cook to save Mom some stress. If they had a large cutting board, that would have helped too. I use mine every weekend, and after cooking at my parent’s house, I understand how valuable it is. I’ll admit that I’m spoiled. Dad made my wife and I a set of knives when we got married, and I can’t imagine what life would be without them. He handcrafted each of the knives in the set… handles, steel… he did it all. They’re the sharpest knives I’ve ever owned. If your dad isn’t hand crafting a set of knives for you, invest in a set. Good knives will get used often. Ok, so you might not want to give disposable latex gloves to that special someone in your life that loves barbecue as a Christmas present. They’re such a good stocking stuffer though. Hands get dirty when you’re prepping meat. Take meat out of the packaging and put it on your prep surface. Wash hands. Prep meat and add seasonings. Wash hands. Place meat in smoker. Wash hands. You see where I’m going with this right? A box of 100 gloves is cheap, and using them makes it easier to prep and smoke meat. I might go through 3 or 4 pairs everytime I cook, but I prefer that over washing and drying my hands in between each step. It saves me a ton of time! This one is kinda self-explanatory. I could have used a pan when I was cooking the brisket referenced above, and they always come in handy when I’m cooking pulled pork or a mess of burgers and need an easy storage solution that will retain some heat. I find myself using my cast iron skillet more and more. Cast Iron holds temp really well, and it’s a necessity if you want to get a good crust on a seared steak. It’s also great to use if you’re going to make shredded beef or pulled pork. Place the meat in the skillet, and then smoke it until it’s done. Letting the meat smoke in the rendered fat adds an extra layer of flavor that I LOVE. If you’re looking for the best of the best when it comes to cast iron skillets, consider the Field Cast Iron Skillet. This is the closest living relative to vintage cast iron: light enough for everyday cooking, with a smooth, naturally non-stick cooking surface. If you’re looking for the best skillet, you’d be hard pressed to find something that performs better than this one. Moving large cuts of meat that are close to 200 degrees can be a challenge. A large spatula makes it easy. When I first got this spatula I thought the size was ridiculous and impractical. I was wrong. I use it ALL THE TIME. You can argue that some of the things above aren’t needed but just go with me here. The next few items on this list are luxury items that are perfect for that guy or gal that loves barbecue and already has everything. Aprons are cheap and easy to wear. I still have a stigma sometimes about wearing one. I don’t know why. That being said, if I come home from work and I’m in charge of dinner, I don’t have time to change out of my work clothes. Slip the apron on, prep and cook the meal, and then slip it off. The apron might get dirty, but your clothes don’t. When you’re smoking meat low and slow it’s inevitable that you’re going to encounter a lot of rendered out fat and grease. The last thing you want is to have that grease get all over your nice clothes. Want a guarantee that your special someone will cook delicious meat for you every month? Get them a subscription to Bucher Box. 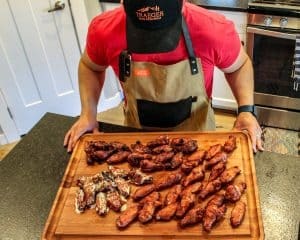 Butcher Box delivers meat right to your doorstep, every month. There’s no way to substitute for standards. That’s why Butcher Box pays special attention to every step of the process. From food to bedding, their animals are cared for. 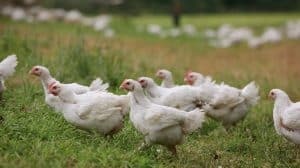 They make sure to accommodate an animal’s natural tendencies – cattle like to roam, hogs like to move dirt with their snouts, and chickens like to peck. All of Butcher Box‘s high-quality meat is humanely raised, without hormones or antibiotics. There are so many good seasonings and rubs out on the market. I prefer to make my own, and if that’s the case, a good spice organizer is essential. Those are just a few, but if you had all 4 of those rubs in your life, you’d be set. Crowd Cow delivers the very best craft meat from the farm to your table. You’ll know the breed, the style of beef and you’ll get to meet (virtually) the small, independent ranch who produced the beef. You pick the exact cuts you want and we deliver it straight to your door. Claim a share, rally your friends, and become a “steak holder”! Free Wagyu Ground Beef with every order, while supplies last. Thermoworks has deals going on all month long. Snake River Farms has some really good deals going on all month long. If you haven’t tried their Kurobuta ribs you’re missing out, and all month long you can get a rack for free. That’s one heck of a deal! 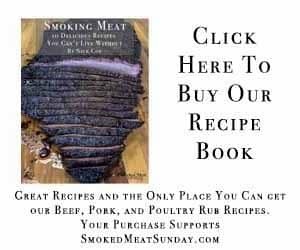 Love grilling, smoking, and bbq? Of course, you do, that’s why you are here. The world is full of people who are masters of the grill. People who can turn a slab of meat into a gift of tender juicy goodness. That means you also love trying new things that will make you a better pitmaster. That’s where the Grill Masters Club comes in. Every month they send you a box of sauces, rubs, marinades, wood chips, new recipes, and grilling accessories to your door. I already talked about Butcher Box above… here’s the most current deal. If you have a sports fan in your life, you’ve gotta check out Fanatics. Fanatics has all the sports gear and memorabilia the sports fan in your life needs. I’ve talked about Flirty Home before. I have one of their aprons, and I love how affordable most of their products are. If you are looking for a good apron, or need a few new basic kitchen tools like spatulas or spoons, check them out! If you have a Weber Smoker or a regular gas grill, you’ve gotta check out the Kettle Pizza. Heat rises, so when you lift the lid on your grill, the heat escapes, making it almost impossible to maintain the high temps needed to cook great pizza. Kettle Pizza inserts provide a front opening that eliminates the need to lift the lid on your grill. With less heat escaping, you can achieve pizza oven temperatures in excess of 750°F, temperatures that your kitchen oven can’t even reach, temperatures closer to those of commercial wood-fired pizza ovens! Holiday gift guides aren’t usually my thing, but after spending time away from my smoker and kitchen, I’ve realized how important some of the tools I have at home really are to me. 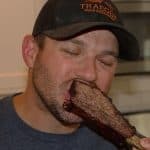 This list certainly isn’t EVERYTHING I have in my kitchen and use when making good barbecue, but this is definitely a good run down of the things I use the most. Anything else I missed that you use and you think I should include? Drop a note in the comments.